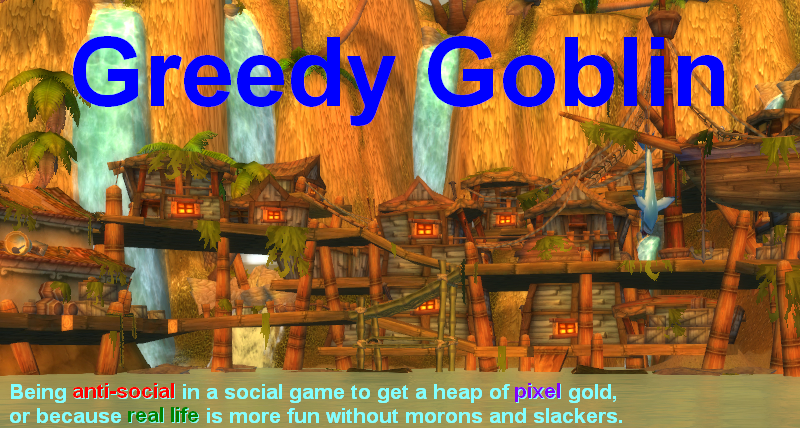 Greedy goblin: More progress and "awesomeness"
First thing first. I want better raid progression, but my raiding time is limited. So I will do the following things to motivate raid leaders: On farm raids I will start collecting 500G/boss leader's gold. You can do the same, so after a successful farm raid you'll have several thousand gold extra. For leading progression raids I offer 1000G prize every time. Just send a mail after the raid, telling when was the raid, summarizing your progress like "Al'Akir at 12%" and you get 1000G. Of course the raid must take at least 1.5 hours. Note on the "newbie gold". It is not there because "newbie will fail and needs to be boosted". Fail gold is there for that. It is there to reward those who did the lengthy firstkill process with many wipes to provide you a farm raid with few wipes. Secondly I want to increase the PvP activity of the guild. Rated BGs are still messed up, you must wait for half an hour to be matched against a top rated team. Average or even better-than average players don't play it. Still we must start practicing, I will put events to the calendar, preferably to weekends in the hope to catch some /trade teams. I also elevate Are you not entertained? prize to 5000/G person, hoping to lure some serious PvP-ers to the guild. Remember, while voice chat is forbidden in guild events, what happens in a fixed arena team stays there. Al'Akir guild run: definitely should be done in a week or two. I will try to organize more progress raids on him. I offer 1000G to everyone present on the firstkill. Nefarian guild run: 1 month max. I offer 1000G to everyone present on the firstkill. Profession achievements: They progress on their own, speeding them up would be insane effort with insane cost. For example getting 37K fish for the fishing achie would take 154 hours of constant fishing. United nations: bugged, will be fixed next patch. The farmable ones are the city attacker and the legendaries. If you see another reachable achievement, please comment. Stolenlegacy wrote another very useful addon: setmynote. Officers of the guilds shall have it, and if a member whispers "!note xyz" then the addon changes their public note to xyz. Why don't they change them themselves? Because you can't allow the members to set notes, because (thanks to crappy programming by Blizzard) if you can set your own note, you can set anyone's which allow trolls to have fun. Members, alts, please set your notes using the "/w someinviter !note xyz" command. To be honest, the most amusing thing of all is the fact that your asocial guild is even 88% of the way to Crittergeddon in the first place. Having said that, I do have to say that you're moving further and further away from a market system. What makes 500g/boss the correct amount to pay? The raid should be setting the amount to pay! All you're doing is imposing unnecessary rules around incentives if your asocial guild was as organised and motivated as you believe they should be. By giving them yet another framework to be applied, you're moving closer and closer to being a standard raiding guild. 2) Penalties (e.g. DKP minus) for fails. 3) Bonuses (e.g. DKP plus) for progression. 4) Bonuses (e.g. DKP plus) for leadership responsibility. 5) Limits on fails - too many fails / DPS too low, get booted. You're not a 'PuG' in spirit anymore. You're a casual raiding guild who uses a GDKP system rather than a DKP system. Every additional rule you impose in order to incentivise people is moving you further away from the spirit of the guild project. @Squishalot: Are you trolling or just dumb? The 500G/boss is NOT a rule, that's my personal proposal. People can accept it or have different offer. That's called market negotiations. The raid penalties are necessary and common in pugs. Of course they have a binary system: nothing or GTFOn00b. The progression bonus isn't coming from the guild, it's coming from me personally. I can spend my own gold the way I want, it's no different from "LF som1 to boost me in VC paying 100G" common in trade. Fixed raid times are necessary as people are not online at the same time. Also I checked my statistics: 6290 critters killed, despite never wanted to kill one. You can't cast an AoE without killing some. You mean there's a reason to have set raid times that doesn't include raiding being a job, or having a job-like approach? Incidentally, how similar are the raid teams from week to week? Given that you force people to be online from 19:00-23:30 if they want to raid (can't pug from The PuG outside those times), I'm curious as to how that is any different in practice from set raid teams of the HC guilds. As for killing critters, grinding Deeprun Rats in the deeprun tram should work, they have a nearly instant respawn on the IF side and there's quite a few around. It's how I used to skillup my melee weapons back when that was still needed. Paying for leading farm raids seems like a bad idea. Except for newcomers, farm raids kinda lead themselves. Maybe you should change it to a flat 150g-from-the-pot for each newcomer. Otherwise, people who are doing the farm raids for valor + gold might feel unmotivated. Also, you should also consider a beginner's gold discount if they do not fail even once, to account for people that already did that boss on another char. For your fishing achievement, set up a "fishing raid"! The spot to get this done is in Borean Tundra. Kill the animals that give you the blood debuff, wash in the lake, and whala, you have "pools" to fish from. That's what our guild did. It took just a few hours. If a PUG uses GDKP then it becomes a casual raiding guild? Or if a guild uses GDKP then it becomes a PUG? I think you're mixing some concepts. However I do agree that Gevlon is using gold the same way any guild will use DKP. The advantage of DKP is that it's created out of thin air, the disadvantage is that you only have access to an internal market (guild). The moment you leave the guild, your DKP becomes thin air again. Gevlon, if you used DKP instead of gold, you could also offer +500DKP for boss or +100DKP for carrying a noob through VC, or +1000000DKP for Shadowmourne. At the end DKP is a currency. I don't get why you got upset. For a critter achivement you can farm worms in a cave at Plaguelands, i'm sure they are not wee at all. @Krytus: DKP gains value by the guild. If I give DKP to someone out of thin air, I make inflation, devaluing everyone else's DKP. So if I give DKP for Shadowmourne, I force everyone in the guild to lose a piece of DKP and give it to the Shadowmourne guy. With gold I simply spend my own gold. The difference between DKP and gold, is that gold is an already existing and established currency within WoW. DKP is a "fake" currency, in the sense that you can only use it to gain items from your raid guild. While gold is the currency of the game itself. Items from the Auction House, repairs, enchants, gems, food, drink, pretty much everything can be bought with gold. To me it feels far more natural to use gold as a raiding currency than any made up guild only currency like DKP in any shape or form. You keep your gold at all times. You take with you what you have when you stop raiding or leave the guild. Can that be said for DKP? I am of course replying to the DKP/market system discussion. 500g/boss leader payment reads as a rule, just like the failgold, newbiegold, and so forth. You say that you "will do the following things to motivate raid leaders" - how can you do this if it is optional? They have always had the ability to charge for raid leadership if they wanted, so presumably, your action "to do the following" is implied to be a new rule. If people can reject it, then you're not doing anything to motivate raid leaders. It doesn't matter that the progression payments are paid from your own pocket or the guild bank, what matters is that there is progression incentive in the form of DKP-equivalent (being gold, since your loot rules are GDKP, obviously). Who pays that is irrelevant, because the progression players now have that cash to spend. The incentive has been laid out. And I agree with Azuriel on the issue of raid times. If people are coming on specifically to meet raid times, then it is a job-like obligation already. If they are generally online at that point in time, then there is no need to have any raid times, as people will be available as and when they are. @ Krytus - I'm not mixing concepts at all. My comments about DKP plus / minus is in relation to the way a conventional guild would work. GDKP is precisely the equivalent, except that you can spend it elsewhere, as you note. What I'm saying is that the rules Gevlon has imposed using GDKP (e.g. GDKP plus / minus for fails, progression and leadership responsibility) are identical to rules that raiding guilds impose using DKP, and as such, the PuG GDKP raid is not a PuG GDKP raid, it's a casual raiding GDKP raid. A /trade PuG running GDKP will penalise failure with /kick and not reward progression / leadership. I've got no qualms with Gevlon insisting on a GDKP loot system, as it's more suitable than /roll, my issue is with the rules in place that belong in raiding guilds, not PuGs. you're a shaman, cope up with a warrior in 2v2, equip resilience gear, 2200 achieved in 50 games. Critter tip: GROUP UP! Each critter killed counts for every member of the group in range. So if you have 5 people in a group, you'll get to the achieve 5x faster. @Squishalot: The important difference you are clearly missing is that Gevlon pays HIS OWN money, not money from the pot. I must admit I didn't read whole Squish's post, only the "500g/boss leader payment reads as a rule..." paragraph. Althought I don't understand Squish's idea now, I see that my previous comment was a nonsence. Maybe could you delete both my posts to clean your blog of a bit of stupidity? I'm sorry for this. I think the more "pushes" or "incentives" you have to introduce, the more you get far from that the intial idea of "The Pug" is not enough. It's my understanding the idea was to show that it's enough to create the right environment, basically a pool of people with low percentage of M&s, to get successful raids going. I won't comment on wether this was achieved or not, but what now you are trying to do is different. You are introducing rules and incentives on top of the idea of "no-M&S environment" to increase success. In any case if you want to attract people you should really focus on PvE progress. Most people won't care at all about how many critters you killed, they do care about how many bosses you were able to down. A new boss-kill will yield far more potential new members that any non-relevant achievement. All you people quibbling really have no valid points. "The PuG" is a raiding guild with very casual requirements of members. Sure, it has set raid times to try to maximize the number of people who would be online and available to raid, but no one is compelled to make any raids, unlike HC guilds. Yes, there are penalties for failure, but so what? The penalized person is free to try to raid again next week, and the penalties and bonuses involve actual usable currency - gold, instead of DKP, which is useless outside the raid. This is a very casual friendly environment that has pretty good success in raiding. No one is compelled to do anything he or she does not wish to do, down to spec, class and so forth. This is a great idea, and your quibblings about this gold bonus or that are just nonsense. No one has to try for any bonus, and Gevlon is paying for much of this stuff out of his own pocket. If you don't like this, set up your own system. "This is a very casual friendly environment that has pretty good success in raiding"
As do so many others with a lot less rules. I agree with some of the previous posters: the enviroment is clearly not enough since you have to create very strong incentives to raiding. What shoudl ahppen naturally, since you M&S free, isn't happening. And why? That should be your main concern. As you have said before, the result is what matters. And the majority of the members aren't raiding and the ones that are are doing it only for the salary. This may be the goblinish asocial method but it's not that different from the social method. @ Eaten by a Grue: ""The PuG" is a raiding guild with very casual requirements of members." * The behavioral rules of the Ganking project work and perfectly capable to keep M&S out. The guild is named "The PuG" for a reason: it wants to simulate PuG-ing from a competent base. Practically being in the guild is like being guildless on a server where everyone are competent. I want to prove that PuG got it's bad name not from being without hierarchy but from the complete lack of skill or even human decency of the available playerbase. I want to prove that if people wouldn't be M&S, there would be no need for organizations and obligations." The number of rules associated with raiding in The PuG suggests that there is most definitely a need for organisations and obligations, despite Gevlon's efforts to keep M&S out. If it's a casual raiding guild, then so be it, but it's not working the project that Gevlon initiated, especially if Gevlon has to pull cash out of his pocket to compensate people. @Chewy, Squishalot: you mistake success and excellence. Only 50K guilds, about 1M raiders killed ONE boss in Cataclysm. Out of 6M players. So by reaching 10 bosses I already proved the original idea. I have a further goal now, to gather and convert non-hopeless socials. However, exactly because they are delusional, 10/12 is "kinda fail", despite he killed 0. To lure them in we have to be "awesome". That's what I'm working on currently. Again I am, Gevlon is working on it, not the guild. No one is forced to support my actions in any form. @ Gevlon: "So by reaching 10 bosses I already proved the original idea." No you haven't, because you've achieved 10 bosses down by having a complex system of rules in place, rather than relying on non-M&S players. All of your progression to date has been with you leading, as far as I'm aware, during strict calendar-announced raid hours, and by enforcing the series of failgold penalties for various raid issues. You've made a decent raiding guild, but you haven't made your point. United Nations is bugged but still very achievable. I think you actually have a point. It is apparent that simply being M&S-free is not sufficient to have raiding success. I think the problem here lies with an underlying assumption by Gevlon that the vast majority of WoW players are M&S. If you go on that assumption, then it is easy to conclude why normal PuGs have such a high failure rate - too many M&S for the ad hoc raid leader to filter out. But if only a small minority of players are truly M&S (wrong/no enchants, no gems, spam auto-attack, etc.) then we have to find other reasons for failure of PuGs (lack of experience raiding, lack of experience working as a group, not knowing boss mechanics, lack of practice at boss mechanics, etc.). And the solution to these shortcomings is simply raiding more and having meaningful feedback/review after failures to try not to repeat same mistakes. Simply keeping M&S out is not enough - deliberate practice is necessary, which is what the GDKP penalties/rewards provide. But I still think it's a great idea, I just don't think it proves that simply being M&S free results in successful raiding. I hear what you're saying. I don't think the problem is necessarily with Gevlon's assumption that the world is full of M&S (in that respect, I do agree with him, even if I don't agree with his precise definition of them), but rather, his assumption that a lack of M&S will lead to success. "Simply keeping M&S out is not enough - deliberate practice is necessary, which is what the GDKP penalties/rewards provide. But I still think it's a great idea, I just don't think it proves that simply being M&S free results in successful raiding." I agree 100%. I have no qualms in acknowledging that The PuG makes a good raiding guild. They're 5th in progression on the server or something like that, to argue that they're not successful raiders is stupid. What isn't stupid is noting that they've done so by following the same formula that many other raiding guilds use, and stayed true to the stated goals - that keeping out M&S will result in successful PuGs. That's all I'm trying to push Gevlon to admit, but noting that he hasn't actually given the guild the chance to test it, because the raiding rules have been around since day 1. If Gevlon removed all raiding rules (fixed raiding times, penalties, bonuses, fail limits) for a couple of months, I'd be curious to see how far the farm raids go, and whether any further progression is achieved. But from everything he's written in the last half year, Gevlon's been too proud to admit that his guild doesn't match back to his project. I think such an experiment would be a true test as to whether or not his hiring rules (to keep out the M&S) and his beliefs (that you can succeed at raiding without taking a job-like approach if you have competent people). But for now, The PuG is merely a raiding guild, and not the project that Gevlon created.